I know I start every blog post this way, but it’s been a while since I posted! Work has been screamingly busy, and I have been exhausted. I was fully and completely prepared to participate in NaNoWriMo 2014, but sadly, I only wrote 237 words total in November. Pathetic. That said, at least I can say that I have started writing OCULARIS (or OCULARIUM – still haven’t quite decided). Editing has also been going more slowly than contemplated on COMPENDIUM, primarily because the folks who have been helping with editing have been slower than I anticipated. Unfortunately, that caused me to lose some momentum in the editing process. I am hoping that I can pick up steam, since my editor has gotten through the portion I was most concerned about. Once COMPENDIUM makes it through this round of editing, I will still need to have it copyedited. Then, perhaps, I can finally launch the book. 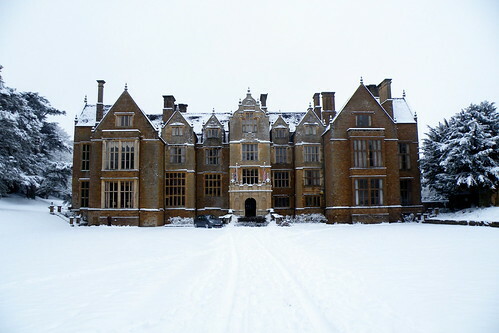 Apart from work hard, attempting to get some editing done, and failing to participate in NaNoWriMo, I have been preparing for the first residency of my MFA program, which starts at Wroxton, England in January. I am going over a few days early to enjoy some time in London. Some of the sights planned are the Tower, the New Year’s Eve fireworks, the Harry Potter Studio Tour, and some other fun activities. I am very much looking forward to my trip. While I am there, I will also make a quick lawyer-related visit to a local London law firm for a bit of a privacy and data security in M&A talk, which should also be fun. FDU hasn’t posted the residency schedule yet, so I don’t yet have everything nailed down solidly, but hopefully I will know soon. Photo by Steve Liloia, taken January 5, 2010, courtesy of Flickr. The timing of this photo does not bode well! I am supposed to arrive at the Abbey January 3. I will have to pack my waterproof boots just in case it is not a mild winter. Probably not a bad idea anyway, since even if it doesn’t snow, it will likely rain. Apart from securing thermal underwear and wool items of various warmth, I have also started on the required reading for the residency. They haven’t posted the full list yet, but I have already finished Hisham Matar’s Anatomy of a Disappearance (which I read over the summer), Herman Melville’s Bartelby the Scrivener (which I actually read in 11th grade but reread to refresh on it), and M.T. Anderson’s Feed. I’m also currently 70% through John Updike’s The Maple Stories, which is a collection of short stories all focusing on a particular married couple and the deterioration of their marriage over a number of years. On top of those books, I’ve been listening to Haruki Murakami’s 1Q84. I’m a little over half way through it (around the mid-point of Book Two). When I began the novel, I didn’t realize how incredibly long it is. That said, I have really enjoyed it thus far. Tengo and Aomame are interesting characters, and I am eager to learn how their lives continue to intersect. I am hoping that I can also finish 1Q84 before the residency. I suppose that at the least, I will have 9 hours on the plane over there. I’m also reading Murakami’s What I Talk About When I Talk About Running, which I am approximately a quarter of the way through. It has been very interesting learning about Murakami’s life, and the book gives me an interesting perspective on 1Q84, especially since Tengo has vied for the New Writer’s Prize multiple times (which Murakami won). I can’t help but feel like there might be a hint of Murakami in Tengo, even though the story is hardly autobiographical. So, apologies if this post has been fragmented. There is a lot going on, and I expect things will stay very busy through the end of this year. Hopefully I should have tons of amazing posts coming out of my first residency at Wroxton and hopefully some really nice photos as well, as much as I thank Mr. Liloia for his reference shot, I look forward to taking my own! About the Featured Photograph: Orange daisy flower taken November, 2014 with an iPhone 6 Plus fitted with an Olloclip x15 macro lens.